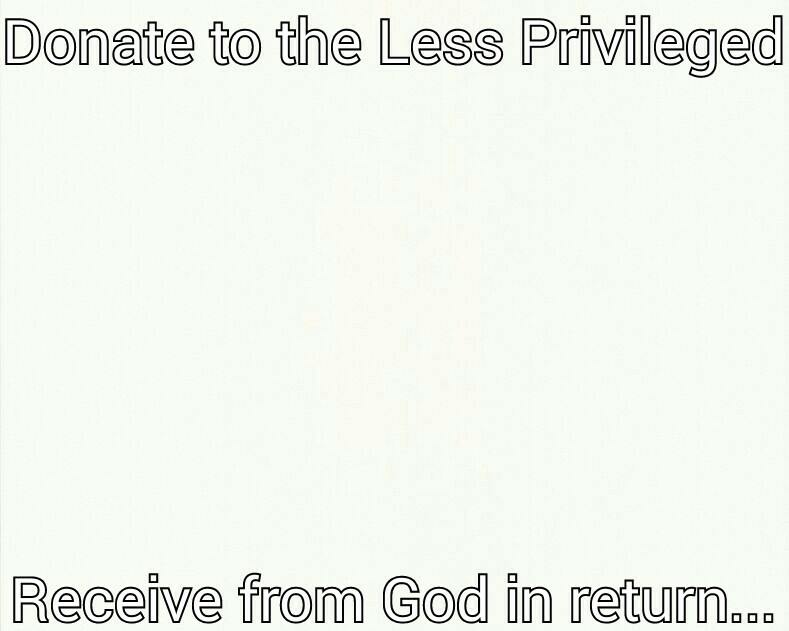 Have you ever made a donation to the less privileged before? I can bet that some of you will want an Intel as to why this question came up in the post.. This comes as one remembers the need to always remember that there re people out there who need and want more. Than we do yet alot of us don’t seem bothered about them. How rich one is actually arrives from how many souls you have helped long your way to riches nd nothing more, so I wonder why and how we amass so much wealth and yet we can’t find ways to donate a certain portion of it to the needy..
Do yourself. Favour, go out there and make research on plce where you can help out. Starting with the orphanages, rehabs, idp’s n loads more and gladly a burden is lifted off your hearts as we all know we are blessed when we bless others in need. It’s Sunday, it’s the last for the month of April.. Celebrate life, Celebrate the less privileged and remember who/where we are/are from. Image: by leX using MEME MAKER.. Previous article Happy Eid Celebrations. I have made donations to those less fortunate. I also volunteer when I can. It's a lovely feeling. lovely feeling to always remember the less privileged. A good reminder! The good deeds need to be shared. The most important of doing these both is the motivation of the heart. motivation is key in this, so trye for without it at heart , you cant do it. In India, social service is given a lot of priority in schools and colleges. In fact, it is almost mandoatory to work after school/college hours in an organisation (old age home, children care homes, orphanages etc. ) for sometime. while working for such organisations, students/ teachers also organise donation drives. I think it only befits us as humans to work towards humanity and help those in need and are less privileged than us. It only makes us a better human being. i dont really get the idea from your response Marta… get something in return like Karma for promoting the idea to give and donate to the needy,,, can you explain better. I haven't really done donations unless giving clothes to homeless is counted as a donation. I've been planning that if I win in a lottery I will walk around the city with money in my pocket and give to those people sitting in the street corner and living outside. Nice. Clothe giving is a good one also. Now I pray you win that lottery sooner than later. yes, true it is good to give back. I believe that helping others is something that makes us all better humans ! Song: Birdy – "People Help The People"
In my earlier job when I was in Mumbai, India, I sponsored the education of one underprivileged gal and it was a great experience as I was feeling completely satisfied from within!